The sequential use of disinfection strategies for drinking water treatments has been shown to provide levels of inactivation greater than those corresponding to the single-step disinfection effects (Corona-Vasquez et al., 2002; EPA, 1999). Therefore, a disinfectants combined system could be applied both for the inactivation of microorganisms, resistant to traditional treatments, and also for limiting the dosage of single disinfectants, reducing cost and risk of by-products formations. In this work, the inactivation of the bacteria E. coli was initially investigated by sequential action of Ultraviolet irradiation (bench-scale collimated beam apparatus equipped with a low pressure Ultraviolet lamp) and either chlorine dioxide or free chlorine. The results showed that a pre-irradiation of 70 J.m-2 Ultraviolet dose (equal to approximately 1.2 log of inactivation) at 20 0C and pH 7.4, increased the following germicidal effect of both chlorine and chlorine dioxide (between 0.04 and 1 mg min L-1). A different order of the disinfectants was also studied and a similar performance was observed. In all cases, an enhanced signal was observed and an inactivation of approximately 1 log greater than that seen in the inactivation curve for free chlorine and chlorine dioxide alone was achieved. An in-situ application of the sequential disinfection system consisted in a combined use of Ultraviolet irradiation and chlorination to eliminate a saprophyte flora interfering during the faecal contamination indicator analyses. Likewise, the outlet of a reservoir for drinking water has been firstly disinfected by chlorine dioxide and then irradiated by Ultraviolet. In both cases, an increase of the microbiological quality of the water was achieved, compared to the quality observed with a single step disinfection. This observation led to more bench scale investigations concerning the potential synergistic effects of Ultraviolet associated with chemical oxidants for water disinfection. In particular, preliminary studies were addresses to synergistic action for virus MS-2 bacteriophages inactivation. Key words: Disinfection, Ultraviolet Irradiation, Synergy, Chlorine, E. coli. In the last decades, the synergy of different disinfectants for drinking water treatments has interested a certain number of scientists in the world. The use of a disinfectant agents combination was adopted mainly in cases where the single use disinfectant (free or combined chlorine as well as ozone) was not effective for specific micro-organisms disinfection (e.g. Cryptosporidium parvum) (Finch et al., 1997). Only recently, the Ultraviolet irradiation was discovered to be an optimal disinfectant for Cryptosporidium parvum, at relatively low doses (Clancy, 2000). Nevertheless the synergetic action of several disinfectant is investigated and the combination of the Ultraviolet irradiation with other disinfectants is considered of great interest. By carefully selecting the primary and secondary disinfectant and avoiding long contact times and high dosages, the total DBP formation has been shown to decline (EPA, 1999). Although the mechanisms of action by which the combination of two disinfectants increases the disinfection action is still not clear, several studies have been published (Rennecker et al., 2000). Most of the work concerns the combination of ozone with free and combined chlorine, few paper are reported on Ultraviolet irradiation combined to other disinfectants. A comparison of single use disinfectants (Ultraviolet, free chlorine and monochloramine) and the combined use of Ultraviolet / free chlorine and Ultraviolet / monochloramine for Cryptosporidium parvum inactivation was presented by Ramirez (Ramirez et al., 2000). Cryptosporidium parvum oocysts were pre-treated with Ultraviolet light at a dose of approximately 1250 J/cm2 (primary inactivation of approximately 1 log) and exposed to monochloramine. The shoulder of the secondary inactivation curve was shorter and the post-shoulder rate of inactivation was approximately the same as that observed for primary treatment with monochloramine. When the secondary disinfectant was free chlorine, the exposure to Ultraviolet light resulted in a decrease in the secondary lag-phase and a two-fold increase in the rate of inactivation in the post –lag phase pseudo first order region. Shin (Shin et al., 2002) studied the kinetics and levels of inactivation of several important waterborne pathogens by various doses of monochromatic, low-pressure (LP) Ultraviolet lamps, followed by free and combined chlorine. The results of this work indicated that there was no apparent evidence of synergism between LP-Ultraviolet and free chlorine for C. parvum oocysts and Adenovirus 5 inactivation, under the condition tested. However, there appeared to be some effect of prior Ultraviolet irradiation on inactivation of a genetically modified strain of S. typhimurium by 1 mg/l of monochloramine. 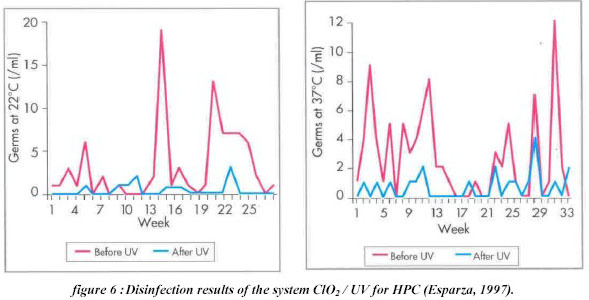 More controlled laboratory studies are necessary to confirm the potential advantages of a preventive use of Ultraviolet associated to others disinfectants, to design new sequential disinfection systems for large scale implementations and drinking water utilities. Cultures of Escherichia coli (strain RIVMWR 1), stored in 50 % glycerol at – 20 0C, were used for inoculation onto a trypto casein soya (TCS) solution. After overnight (16 h) incubation at 37 0C, an inoculum of 10 µl was added to 10 ml of fresh TCS at 37 0C for other 16 hours of incubation (corresponding to the late exponential phase of growth). The culture was then harvested by centrifugation for 5 minutes (4 rpm), and the pellet resuspended in 10 mM phosphate buffered saline (PBS) at pH 7.4 (2.7 mM KCl, 137 mM NaCl), after two washes in the same buffer and re-homogenisation, using a vortex mixer. The stock was diluted in PBS to a working concentration of 106 /ml. The E. coli stock suspension concentration was determined by pour plate method and by optical density (OD) at 578 nm. A calibration curve of the absorbance in function of the bacteria concentration was obtained. The concentration of E. coli was checked before each experiment by absorbance reading. A stock suspension of MS-2 bacteriophages was stored at –20 0C at a concentration of 3*1011 /ml. The stock was diluted in PBS to achieve a concentration of 3*107 /ml. The effect of ultraviolet irradiation on E. coli was investigated at bench scale, using a 254 nm collimated beam apparatus (Calgon Carbon). It consists of one 8 Watt low pressure (LP) mercury vapor germicidal lamp emitting nearly monochromatic Ultraviolet radiation at 253.7 nm. Ultraviolet irradiance at 253.7 nm was measured with a radiometer IL1700. The irradiation dose was calculated using a calculation file for dose-response curve programmed by"Bolton" (519-741-6283) which takes into consideration all the parameters playing a role in the irradiation of a water samples. The suspension was kept under stirring during all the irradiation time, at room temperature. The proportion of surviving organisms was detected by pour plate method and plotted against Ultraviolet dose. A non irradiated control sample was always considered. Chlorine dioxide was obtained by mixing in very little amount diluted solution of sodium chlorite (7.5%: from stock, 0.8 g in 10 ml of water Millipore Ultrapure) and chloride acid (9%: HCl from stock 35%, 1:4 dilution of 35% HCl in water Millipore Ultrapure). In a 15 ml polyethylene container, 7.5% NaClO2 (2.5 ml ) was added first, followed by 9 % HCl (2.5 ml). The reacting solution was mixed very gently and left still for about 10 minutes, in the dark. After filling with water, the bottle content was transferred in a brown glass bottle (250 ml), containing 150 ml of water and filled to a final volume of 250 ml. The chlorine dioxide concentrations was determined by direct light spectro-photometry (reading absorbance at 360 nm, molar absorbivity = 1250 M-1 cm-1). Household bench (2.6 % active chlorine, Javel) was diluted in chlorine demand free water to prepare a 2.5 mg/L stock solution. Working solutions of free chlorine at target concentrations was prepared in same water prior to experiments. The yield was analysed using the N, N diethyl-p-phenylenediamine (DPD) colorimetric method. 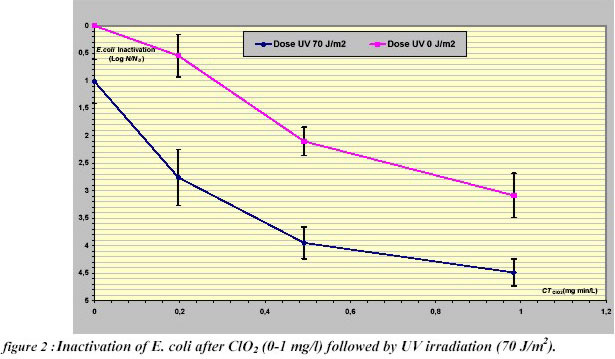 The inactivation curves for E. coli by pre-Ultraviolet irradiation at 50 - 70 J/m2 and ClO2, in a range of concentrations of 0.05-1 mg/L are shown in Figure 1. The treatment with ClO2 alone was characterised by a curve with a shoulder region followed by a decrease in viability, whilst no shoulder was observed after the Ultraviolet pre-treatment. Moreover, a rate of inactivation post shoulder was enhanced in the case of combined disinfection for a concentration of chlorine dioxide of 0.4 mg/L min. A synergistic effect was obtained with peaks of 0.91 and 1.42 (70 J/m2 and 50 J/m2 respectively) for ClO2 of 0.4 mg/L min. When the Ultraviolet was used as a secondary disinfectant (Figure 2), a similar enhanced inactivation was observed and a synergistic effect was achieved with a maximum of 1.2 log for 0.20 mg/L min. In this case, a decrease of synergy was observed by increasing the concentrations of chemical disinfectant. 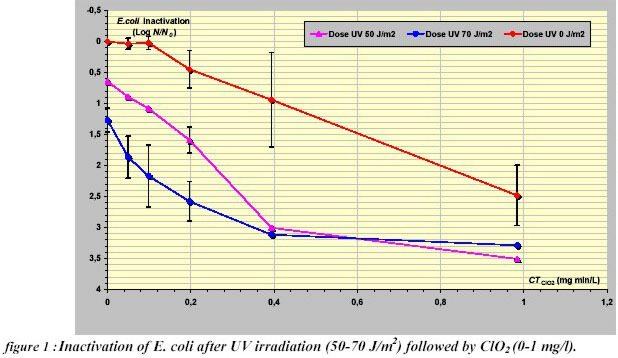 The inactivation of E.coli was also observed after simultaneous disinfectant action of Ultraviolet (70 J/m2) and ClO2 (0.02-1 mg/L min) (Figure 3). When a CT= 0.2 mg/L min was applied, an inactivation of 4 logs was achieved for the combined disinfection, whereas the only chlorine dioxide gave less than 1 log inactivation. An enhanced inactivation of 1.47 log due to the synergistic effect was observed. Also, the dosage of chlorine dioxide seemed to increase as the synergistic effect decreased. Since the different order does not seem to be responsible for important improvements of synergy, it was decided to use Ultraviolet irradiation as first disinfectant for having the chemical agents as secondary disinfectant. This provides a residual in the distribution systems, thus a minor risk of undesired by-products, due to the Ultraviolet action in the presence of the chemical disinfectants or other water components. 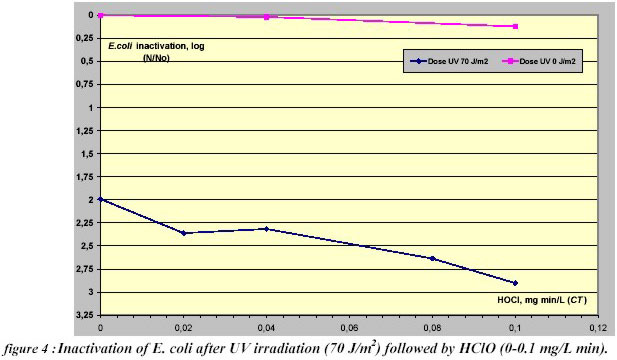 Likewise, the synergistic effect of Ultraviolet combined to HClO was tested and the inactivation curve for E. coli disinfection is presented in Figure 4.
synergy of 0.8 log for CT= 0.1 mg/L min. Further studies need to be carried for this synergetic disinfection system. The synergy observed for all experiments is summarised in table 1. 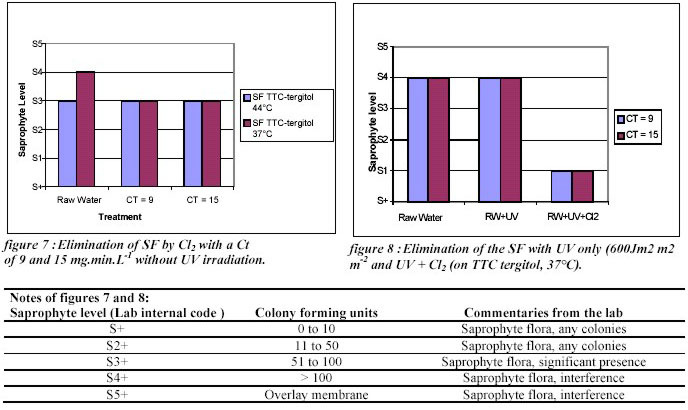 A similar approach was carried out for inactivation of MS-2 bacteriophages by pre-irradiation with a dose of 200 J/m2, followed by ClO2 (CT= 0.05-0.5 mg/L min) (Figure 5). 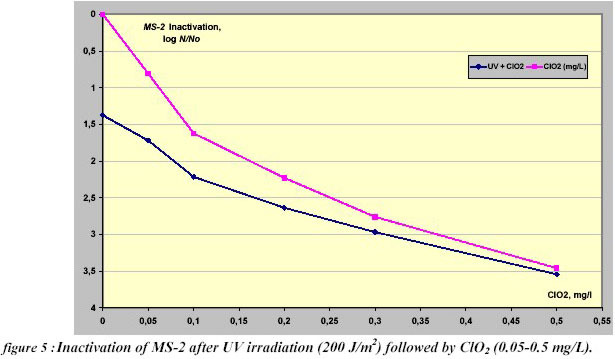 In this case there was no apparent evidence of synergism between Ultraviolet irradiation and chlorine dioxide for MS-2 inactivation. Even in absence of synergy, the application of the additional disinfectants allows a considerable inactivation of resistant micro-organisms such as viruses. Sequential disinfection using Ultraviolet combined disinfection system has been applied to different water plants. A first disinfection process based on combined ClO2 / Ultraviolet action has been used for a drinking water plant close to Toulouse (France)(Esparza, 1997). The disinfection procedure was initially carried on with chlorine dioxide. The water was then delivered to a reservoir where, before the distribution, a new disinfection step was realised with Ultraviolet. The curves in Figure 6 show a high inactivation of germs (the heterotrophic plate count (HPC) was applied for micro-organism measurements, at both 22 0C and 33 0C) during the weeks of the disinfection treatment. A good disinfection was obtained in terms of germs inactivation. 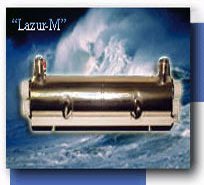 (lower than 2/ml after disinfection treatment) and a low consumption of chemicals was also guaranteed (Esparza, 1997). Another example of sequential disinfection on field application concerns the elimination of a saprophyte flora on a spring close to Deauville (France). The presence of a saprophyte flora (SF) provoked interference during the E.coli analyses (TTC Tergitol, pour-plate counting method). Despite an initial disinfection step with gaseous chlorine, the saprophyte flora was still present in high concentration. The following application of Ultraviolet (via a low pressure lamp), at a dose up to 1000 J.m-2 did not allow a sufficient elimination of the interference neither. The sequential disinfection Ultraviolet / Cl2 showed a very good result in comparison with the results obtained with the individual treatments as it is presented on the Figures 7 and 8. Figures 7 and 8 showed that even if the chlorination and the Ultraviolet irradiation alone could not provide a sufficient disinfection, the combination of the two processes allowed to reach the objectives, without risk of a by-products formation. These results are in agreement with the data observed in the laboratory experiments on E. coli. A good synergy was observed for E.coli inactivation after Ultraviolet / ClO2 treatment during the bench scale experiments, independently from the disinfectants order. The synergy effect was of 1.4 log inactivation for range 0.1-0.5 mg/L min of ClO2 The use of Ultraviolet as primary disinfectant resulted in removal of the shoulder region for secondary disinfection. 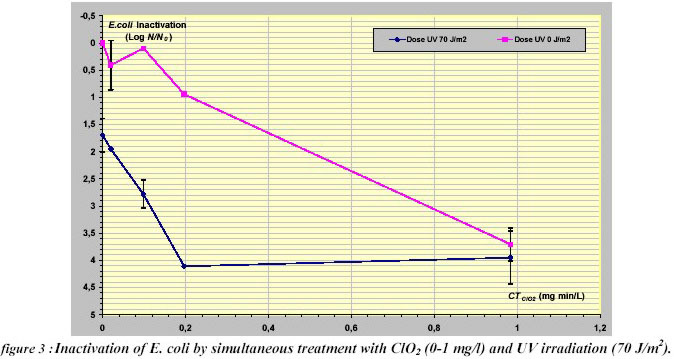 Synergistic effect was observed for E.coli inactivation after Ultraviolet / HClO treatment with a rate of inactivation up to 0.8 log for 0.1 mg/L min. Even in absence of synergy, the application of the additional disinfectants can allow a considerable inactivation of the micro-organisms. Examples of sequential disinfection for larger implementations are reported and, despite the more complex experimental conditions, the results were in agreement with the laboratory results. A preventive use of Ultraviolet would be envisaged since it reduces the risk of harmful disinfection by-products and it is effective for inactivating resistant micro-organisms. Other disinfectants (e.g. ozone) combined with Ultraviolet should be considered. Clancy, J.L. (2000). Ultraviolet light inactivation of Cryptosporidium. IOA, Berlin, Oct. 23-26 III.2.1-III.2.14. Corona-Vasquez, B., et al. (2002). Sequential inactivation of Cryptosporidium parvum oocysts with chlorine dioxide followed by free chlorine or monochloramine. Water Research. 36, 178-188. EPA. (1999). Alternative disinfectants and oxidants. EPA, April 1999. Guidance Manual, Combined Disinfectants. 9-30. Esparza, A. (1997). La technique de desinfection par U.V. appliquee a la production d'eau potable a Toulouse. L'eau, l'Industrie, les Nuisances. 205, 45-47. Finch, G.B., et al. (1997). Effect of various disinfection methods on the inactivation of Cryptosporidium. AWWA Research Foundation Report, Denver, USA. phosphate buffer. Journal of Environmental Engineering-Asce. 127, 594-603. Rennecker, J.L., et al. (2000). Synergy in sequential inactivation of Cryptosporidium parvum with ozone/free chlorine and ozone/monochloramine. Water Research. 34, 4121-4130. Shin, G.A., et al. (2002). Sequential disinfection with Ultraviolet irradiation and chlorine species on several important waterborne pathogens. Awwa. Water Quality Technology Conference, Seattle, WA, USA.